It’s been 2 years since my DDSUtils were released the first time and updates came a year later. As I work myself into rFactor2, I did some updates to Radds and Badds and made them available on CTDP’s website. 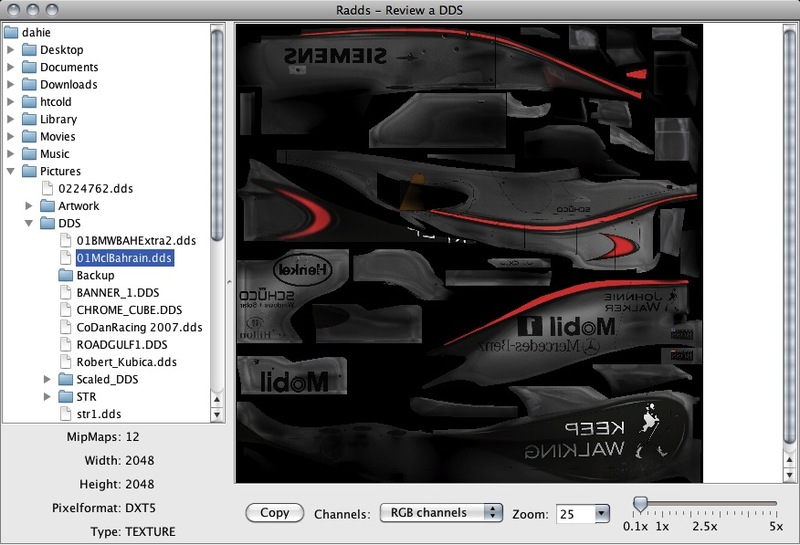 Radds is a simple texture reviewer and Dropps a texture converter. You can start both apps right from the website and use them. I will make the download of the latest versions available later. Badds is not available yet, as it will also get another update some time in the future.The DDSUtils are Open Source and hosted at github. Every now and then we get a request of people to join CTDP with the aim to learn X. Be it modeling, textures or any other skills related to Modding. Today we’d like to give a few hints where to get started with the endeavor to learn 3D-modeling. It’s a rather long way before you can start to model a complex shape like a F1 car. So the first steps would be to learn how to set up blueprints for a car. There are a lot of tutorials available that deal with these topics. They guide you through the whole process from setting up the blueprints over the modeling and basic techniques used till you have finished your first car. These tutorials focus on cars with pretty simple shapes as it doesn’t make sense to learn modeling by recreating a pre-2009 Formula One car with its complex shape and all that winglets. These are some Tutorials we can recommend to start off. After you finished your first model try another car. Try some harder shapes but still use accurate blueprints which are a good aid in the beginning. Focus on getting a smooth shape and try to find your own modeling style. Don’t copy other people that created these tutorials. That won’t help you if you try to model a Formula One car or some other car where you don’t have any blueprints and of course tutorials. Speaking of modeling Formula One cars (or other racing cars). The most important step before starting a racing car without a blueprint is research. As you don’t have any blueprints – and if you have you can’t be sure how accurate they are – you have to get the proportions right. So take a look at the technical regulations. The tell you a let about the cars measurement. They can tell you the size of a cockpit opening or the position and size of the rear wing. Also try to find good sideview pictures of your car to use that as a ‘blueprint’. By looking at these tutorials you’ll find that some start with a simple polygon (quad) and others start with a box. Don’t hang on that too much. That’s more a personal preference which suits your style. In the end you’ll be working with polygons. And always aim to use quads. If you have to use triangles but never let a face have more than four vertices. There are also some techniques that use spline-modeling or maybe patch-modeling. But in our opinion that are more advanced modeling techniques and not suited for beginners. If you’re pretty secure with the polymodeling and you found your own style you can start to experiment with these techniques. I find them very useful – especially the patches – if you want to recreate complex forms without spending much time. Through the splines you have a rather easy but still a very accurate way to control the form of your patch. There are many 3d modeling tools out there. Maybe some of you know “the big 3”, Autodesk Maya, Autodesk 3d Studio Max & Autodesk XSI (former Softimage XSI). But there are a lot of cheaper (Maxon Cinema 4D & Luxology Modo) and some open source (for example Blender) softwares available. Which one is the right one for your first modeling attempt? Well let me tell you one thing: it’s just a matter of taste. If you know how to model in one application you can adapt all your skills pretty fast to another one. Sure you have special features in some of these tools but the basics are all the same. 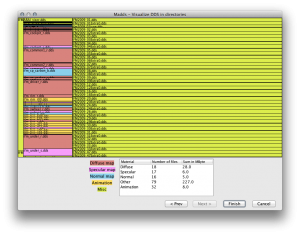 Most modders start with 3D Studio Max because it’s quite popular within the game industry. Maya is also a good choice to start. Nevertheless is the learning curve with the node based User Interface and the Hotbox pretty tough. Softimage XSI looks weird if you start it the first time but it’s very handy for organic and “freestyle” modeling. Cinema 4D is most used in the architectural industry but still some of the modders (for example spoony from LMT) are using it to model F1 cars. Modo is a very cool tool, too. It has a great performance in modeling and useful tools but it’s not that popular and therefore you won’t find many tutorials for it. Blender will be adressed by msater at a later time. You see, each application has its advantage, but 80% of the tutorials out there are covering 3D Studio Max. That’s why you should start with this application (if available). After your first few cars you can try to do parts or the whole car of your next project in a different program to get an overview. Most of the 3D modelers in game or CG industry have basic knowledge in more than three 3D applications. The get a specialist you need to know the basics of each program and pick the one which fits best to your expertise and personal taste. We take questions! If you are stuck with a problem or have questions related to modeling ask them and we will adress them in a future post here on the blog. Thanks to TwoOneOne for some of the tutorials links. I finished work on for a new version of some of my DDS-Utils. Badds received no changes, but Dropps and Radds are now both available as version 1.1. Both tools now support 2 more graphics formats. You can now import GrandPrix4-TEX and TGA-files, This allows you to convert GP4-textures in one drop. In Radds you can now refresh the file system tree. I also fixed many errors and improved stability. Dropps now supports conversion from TGA and TEX. Badds was not updated. it’s for batch scaling large amounts of DDS-files at once. All three tools are released under the Gnu Public License V3. The source code repository at Github is open for everyone and I encourage forking and modification. At Github is also an issue tracker and I’m happy about feedback. This is a personal project of mine and not directly related to CTDP. However, as the topic is related to Modding I think this is still a good place to announce it. In 2008 I programmed a small Java library to read and save compressed DirectDrawSurfaces(DDS) files. DDS is the common texture format in rFactor and part of DirectX. I had the problem, that I moved to a Mac and there were no applications to work with DDS-images. So I developed three tools to work with textures even on platforms other than Windows, but they work on Windows as well. 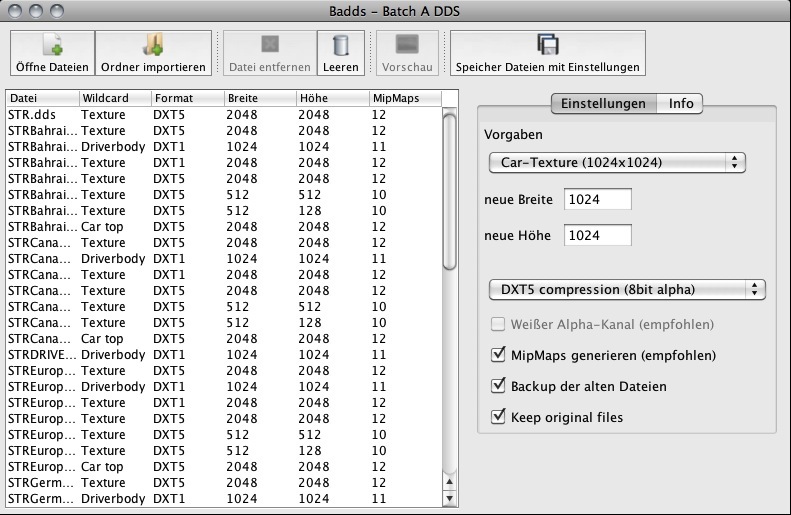 Badds is a batch editing tool for mass scaling textures. In for our mods we paint textures in 2048×2048 and we end up having hundreds of textures. This tool allows to scale and resave many textures at once and not having to save them one by one. 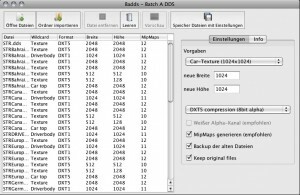 DDS can be saved in DXT1-5 compression. 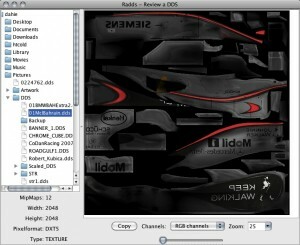 Radds is a for preview and review of textures. It’s a simple file browser and texture viewer with zoom and allows to view single color channels. Dropps is a small programm for easy image conversion to the DDS-format by simple drag and drop. This supports PNG, JPG and BMP. DDS can be saved in DXT1-5 compression. All three tools are released under the OpenSource GPLv3 License. The Source Code Repository at Github is open for everyone and I encourage forking and modification. At Github is also an issue tracker and I’m happy about feedback.